To meet the required precautions and acknowledge the facts of a risk-taking hobby such as deer hunting, is to assure that you will have a safe experience this season and for many seasons to follow. Deer hunting safety is an essential part of the sport itself. No matter how long you have been a deer hunter, no matter if you have fifty years experience or if you are just starting out, the most important part of your adventures hunting will always be deer hunting safety. Remember, there could be, and often are, other people around during deer season. Are you a Deer Hunter? Then this may be just for you! Think of their safety and your own with basic deer hunting safety guidelines. In the beautiful atmosphere of autumn is game ripe for the hunting and wonderful experiences to be had. However, potential dangers are always a factor when dealing with weapons and sometimes unpredictable situations. Make sure that any firearm is treated as though it were loaded and ready to fire, and always remember to keep the safety on, without exception, unless the weapon is about to be used. Deer hunting safety stresses this especially, because accidents really do happen, just by simple mistakes. Keep in complete control of your weapon. Only aim you gun when you intend to shoot and at no other time, again, without exception. In other words, aim only at the game you intend to shoot. Make sure you have targeted an area with no one in close range of your game. Always wear blaze (or a neon-bright) orange outer layer this is absolutely one of the best forms of deer hunting safety you can practice. Be sure you are not targeted as game!!! In addition to wearing bright orange, always have a flashlight with you when hunting in the dark. You can be a danger to yourself and others if you are not alert while hunting. Deer hunting safety depends upon observation and ability  if you are impaired by sleepiness, deer hunting safety indicates that you should not participate. Be sure to use a harness or safety belt. Always work within your own physical limits. Do not attempt to climb where you cannot. Never climb with equipment. Use a haul line. Anne Clarke writes numerous articles for websites on gardening, parenting, recreation, fashion, and home decor. Her background includes teaching and gardening. For more of her articles about deer hunting safety, please visit Hunting Safety. Most of the above guidelines will also be important for a hunting safari in Africa, except that on Uitspan Hunting Ranch (like on a lot of other hunting ranches in Namibia), you will not have the problem of anyone else in close range as mentioned above). That is...except for your PH! 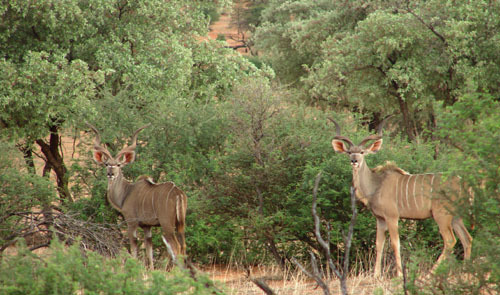 Kudu Bulls on Uitspan Hunting Ranch in the Kalahari... green here after a good rain season! Enjoy some great Africa Videos at this link.